Nothing says summer quite like America’s pastime. Start planning your day at the ballpark with the 2016 Jeep Compass High Altitude. The leather-trimmed seats and power sunroof will make getting to the game, well, a day in the park. Once you arrive, the generous cargo space and available flip-down liftgate speakers will make you the all-star of any tailgate. Just make sure you have Take Me Out to the Ballgame on your playlist. At least once every summer you need to get away for peace of mind. Head to the woods and clear your head in the 2016 Jeep Grand Cherokee Overland. The legendary off-road vehicle can tackle any environment, and has the Trail Rated® badge to prove it. On four-wheel-drive models, the standard Quadra-Trac II® 4×4 system features a two-speed transfer case that uses input from a variety of sensors in order to determine tire slip at the earliest possible moment and take corrective action – sending as much as 100% of available torque to the axle with the most traction so you can plan your camping trip in any location and in nearly any weather conditions. The summer road trip is a right of passage in America. It’s a way to revive the senses and expand boundaries. For those daring enough to explore new locations, the Jeep Renegade 75th Anniversary edition will transport you to the far reaches of your city and your country. And since the best part of a road trip is the open-air freedom, the available My Sky® dual-panel roof will let in the sunshine and summer breezes. Just try to make it home before autumn, if you can. Whether there’s a trail in your hometown or you’re traveling to a Jeep Jamboree USA event, summer is the time to see what your 2016 Jeep Wrangler Rubicon — the vehicle Four Wheeler magazine named “4×4 of the Decade” — is really capable of. 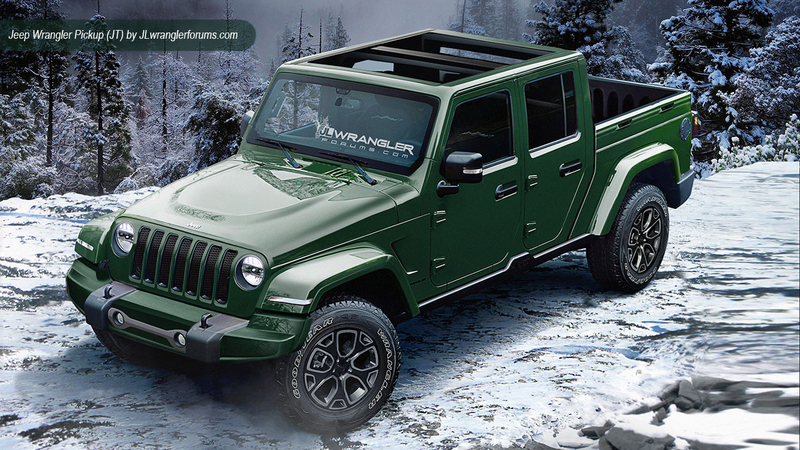 Every Jeep Wrangler is fortified with underbody skid plates to help protect the fuel tank and transfer case, and heavy-duty, forged-steel dual front and single rear frame-mounted tow hooks come standard, in case you come upon a fellow trail rider in a pinch. If the forecast is sunny and conditions allow, drop the top and take off the doors* for a truly exhilarating summer trail ride. Want to turn heads at the beach this summer? Pull up to shore in the unforgettable Jeep Cherokee and stake your claim in the sand. Featuring the innovative Jeep brand cargo management system with handy hooks and removable holders, the 2016 Jeep Cherokee is ready to haul your beach towels, cooler, flying disc, wakeboard and umbrella to the beach, not to mention buckets and shovels for the kids. The smell of a grill is the smell of summer. You’re obligated to enjoy as many cookouts as possible, and to play all the croquet and badminton you can handle. Arrive with the family in the 2016 Jeep Patriot High Altitude, with bright exterior accents and the available 4×4 system, and show your true colors. The Patriot helps protect your most precious cargo with safety and security features, including a total of six airbags† and available ParkView® Rear Back Up Camera. Jeep has flashed some serious off-road muscle in both Moab and New York this month. While the bright lights and polished floors of the Jacob Javits Center don’t make for quite as dramatic a Jeep reveal backdrop as the red cliffs and towers of Moab, that’s where folks will find the biggest Jeep debuts right now. The new 2017 Grand Cherokee Trailhawk wears a raft of upgrades that make it the “most capable factory-produced Grand Cherokee ever,” while the Jeep Summit debuts as the most luxurious. Moab’s Easter Jeep Safari isn’t just notable to this story because it shares some of the New York Auto Show’s dates once again this year, but because it was the birthplace of the official Trailhawk trim, with the Grand Cherokee serving as the launch vehicle. 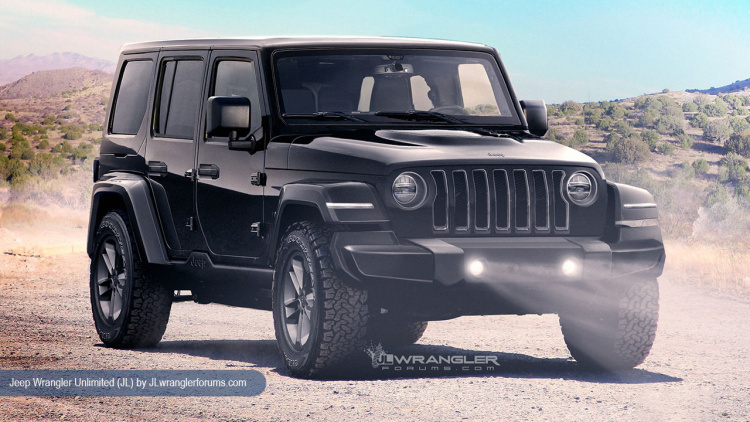 The Trailhawk name existed at Jeep for a while, and was used on an open-top, Wrangler-based 2007 concept car, but it really gained steam at the 46th Annual Jeep Safari in 2012. Jeep’s annual slate of Safari concept models that year included the Grand Cherokee Trailhawk Concept. Quite simple by Jeep Safari concept standards (especially compared to the Mighty FC also revealed that year), the 2012 Trailhawk concept was a look at a Grand Cherokee with elevated off-road readiness. It included Mopar rock rails, 18-in Goodyear off-road tires, and red, mineral gray and black accents throughout. It wasn’t nearly as radical or lust-worthy as other Jeep Safari concepts then and since, but the modest Trailhawk package was one of the more production-ready designs to come out of the annual Safari gathering. Jeep experimented with a short-lived production Grand Cherokee Trailhawk in model year 2013, then gave the “Trailhawk” a hard launch as the most capable of the four model options on the 2014 Cherokee redux. It followed up with a Renegade Trailhawk. “Our Cherokee and Renegade Trailhawk models are among our fastest selling and most sought-after models, and we are following that successful formula to provide consumers even more legendary Jeep 4×4 capability for Grand Cherokee,” explains Jeep chief Mike Manley. The newest Trailhawk follows the original Grand Cherokee Trailhawk concept closely, sliding a set of burlier off-road-ready standard equipment under and around the driver. That equipment includes Jeep’s Quadra-Drive II 4×4 system with rear electronic limited slip differential (ELSD), a tweaked, Trailhawk-spec version of the Grand Cherokee’s Quadra-Lift air suspension, 18-in Goodyear Adventure off-road tires (20-in Adventures available optionally), skid plates and an anti-glare hood decal. Jeep says that the model has up to 10.8 in of ground clearance. Of course, many folks aren’t happy just knowing they have the most capable Grand Cherokee in the showroom – they want others to know, too. The new Trailhawk has a variety of distinct visual cues, including front and rear Trailhawk red tow hooks, a front fascia lifted from the 75th Anniversary Grand Cherokee, Trailhawk and Trail Rated badges, and gray accents on the mirror housings and roof rack. Mopar rock rails are available optionally. 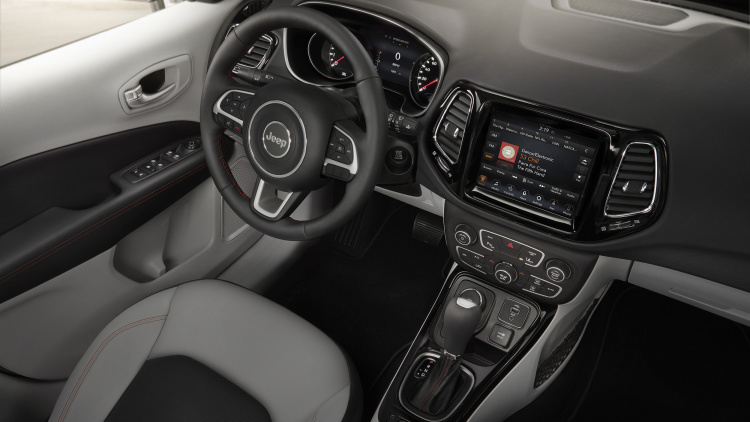 The black Trailhawk interior includes leather and suede performance seats, red contrast stitching, a Trailhawk-badged steering wheel, and brushed piano black and gun metal-finish accents. The standard 8.4-in Uconnect infotainment system includes off-road-specific readings of things like wheel articulation, suspension height, and Selec-Terrain mode. The Trailhawk will arrive in showrooms late this summer (Northern Hemisphere) in a variety of colors and with the full slate of Grand Cherokee engine options (minus the SRT 6.4-liter V8). Pricing has not yet been released, but for reference, the 2016 Cherokee Trailhawk is priced US$7,600 more than the Cherokee base Sport 4×2 trim and the Renegade Trailhawk is $8,750 more than the Renegade Sport 4×2 trim. Rounding out the six-model 2017 Jeep lineup is the all-new Jeep Summit, also introduced in New York. If the Trailhawk is the brutish dirt rat of the Grand Cherokee family, the Summit is the posh urbanite. Jeep calls this one its most luxurious full-size SUV, and premium features like the full-wrap Laguna leather interior, 19-speaker, 825-watt Harman Kardon audio system, acoustic windshield and side glass, lighted door sill, headlamp washers and auto-folding power mirrors make it so. Like the Trailhawk, the Summit tackles the ground ahead with help from the Quadra-Drive II 4×4 system with ELSD. It also comes standard with Quadra-Lift air suspension, Selec-Speed Control and driver assistance features like adaptive cruise control, blind spot detection, forward collision warning, lane departure warning, and parallel/perpendicular park assist. The exterior includes an updated front fascia, LED fog lamps and new 20-in polished aluminum wheels. The Summit will roll out during the same late summer timeframe as the Trailhawk. In November, we visited the sales race between the new Jeep Cherokee and the Jeep Wrangler — a modern, lighter-duty vehicle and a heavy-duty traditionalist. The Wrangler had been falling behind, possibly because Daimler did not build the plant with any expansion in mind. Those constraints will not ease until, ironically, the Wrangler takes over the Cherokee’s plant, pushing the more modern Jeep out of Ohio. The Wrangler sells as quickly as it can be built, despite the lack of a recent redesign or most of the Cherokee’s gizmos and creature comforts. In November, US buyers had picked up 196,211 Jeep Cherokees, versus 187,111 Jeep Wranglers and 174,950 Jeep Grand Cherokees. Canadians had chosen Cherokees as the top Jeep every month of the year, and outside North America, the Cherokee easily outsells the Wrangler. For 2015 as a whole, the Jeep Cherokee easily beat the Jeep Wrangler (in the US), 220,260 to 202,702; the pair were closer in 2015, when the Wrangler beat the Cherokee by around 3,200 sales. The Grand Cherokee came in at #3, with 195,958 sales. 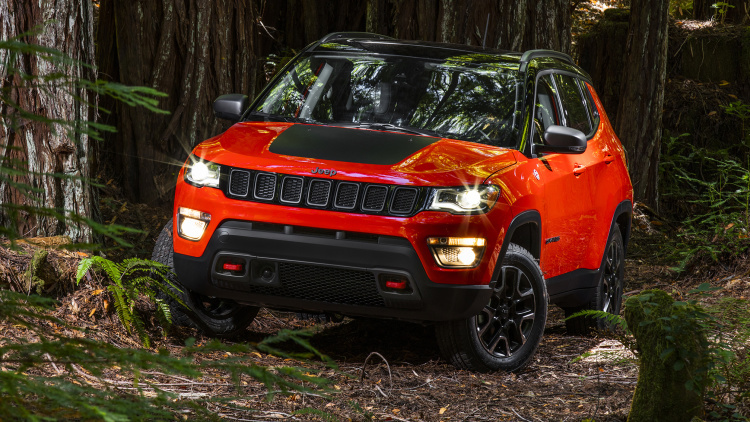 The other Jeep race was between the new Jeep Renegade and the Jeep Compass, and we’d called it for the Compass, which had a full year of sales vs the abbreviated Renegade 2015. Not surprisingly, the Compass, with just 66,698 sales, eked out a Pyrrhic victory over the Renegade, with 60,946. 2016 will almost certainly change the order; though a new Jeep Compass is due at some point. In the meantime, the Patriot’s surprising 27% gain, to nearly 120,000 sales, made keeping it around a paying proposition. There is another disclaimer: there are two Jeep Wrangler models, on different wheelbases, but there are also two cars using the same basic chassis on the Grand Cherokee side. Adding Dodge Durango sales to the Grand Cherokee (as Wrangler Unlimited is added to Wrangler) would easily push that pair to the top.